This week was back to a normal schedule for us, at least it was supposed to be. 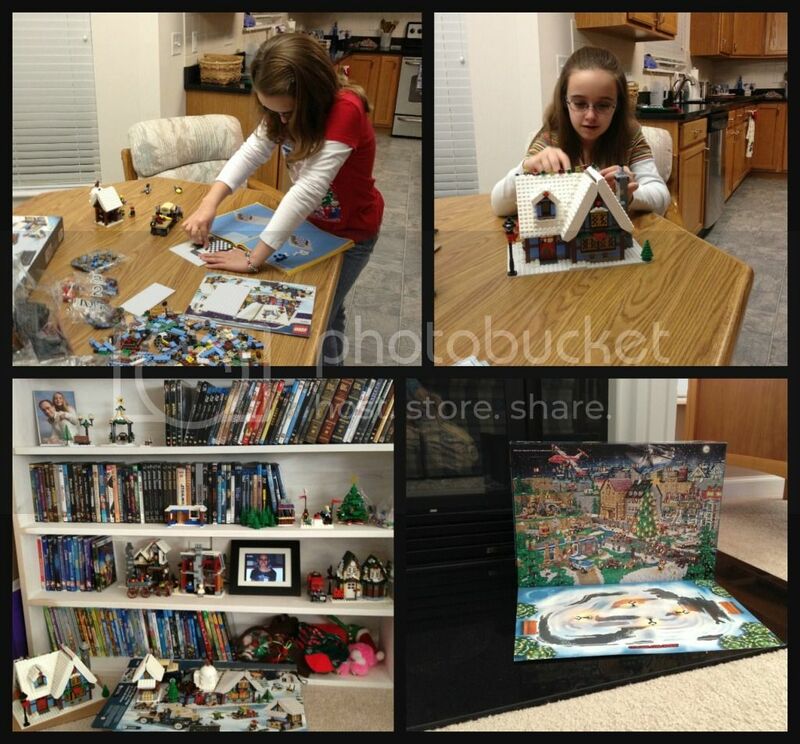 After a fun holiday, a weekend spent decorating for Christmas, and hours of building Amber's latest addition to the LEGO Winter Village, we were ready for the full and final week of regular classes before we start our two Christmas studies. Both the Nutcracker study, and A Christmas Carol study will encompass history, reading, literature, writing, spelling, and art. The Nutcracker will also include music, on top of piano and voice lessons that are in full force right now. I have a vague outline of our Nutcracker study already posted, but I'm going to update that this weekend with my full lesson plans. So, if you are interested it should be ready by Monday. I'm also going to post the lesson plans for A Christmas Carol. The idea is to make it fun, a little more relaxed, and festive, while still providing the majority of the subjects we normally study each week. Math, science, grammar and Latin will be from our normal curriculum, but not as rigorous. (Top R) Playing with newly built cottage and accessories. It took 2 days to complete. (Bottom L) All of the Winter Village. She has it out only at Christmas time and plays with it on the shelves so she can be by the Christmas tree. It works for her. Makes my family room look... lived in. (Bottom R) Eagerly awaiting Saturday, to start the LEGO advent calendar. Unfortunately, plans sometimes go awry just as ours did on Tuesday. Amber had an orthodontist appointment late in the morning and we should have had time for a couple of subjects beforehand. She was uncharacteristically difficult to awaken and sluggish. Amber was even resistant to eat a breakfast of her beloved cinnamon bread. After a difficult morning we made it to the orthodontist for a difficult tightening that resulted in new thicker wires (yet again) and now rubberbands that restrict her mouth opening. It's isn't working well for a child with many sensory issues. Turns out the difficult morning was the result of a 24 hour stomach bug that is going around. Amber demonstrated this for me on the way home from the orthodontist. Thankfully, she had something in the backseat to catch her demonstration, and my pretty car was saved from a thorough cleaning. This did put school on hold for Tuesday and most of Wednesday. Amber also missed the majority of her dance classes this week... 2 weeks before recital. I guess it was better than dress rehearsal week. After some schedule juggling, we did finish all school related items that absolutely needed to be wrapped up before moving on to our two Christmas studies. Poor thing, didn't feel good for a couple of days. She eventually wanted the air mattress set up in my bedroom so she could be by me at night. Basically, she watched TV and slept for 2 days. 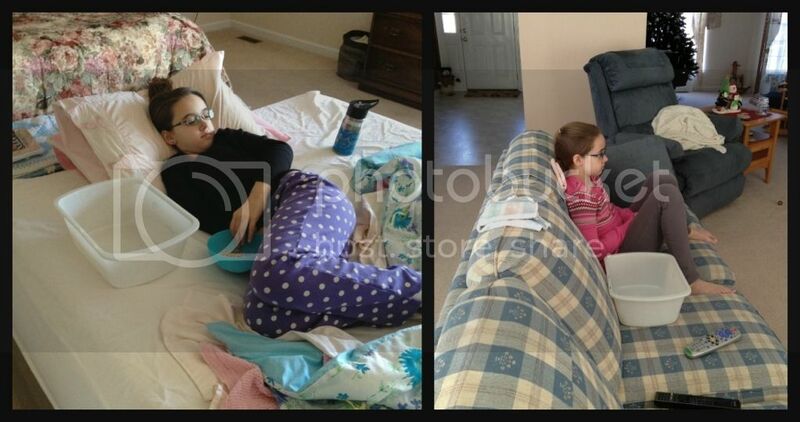 However, Amber's illness made me thankful once again that we homeschool. I didn't have to make the decision about sending her or not sending her to school any days. She wasn't forced into P.E. classes or recess when she barely had the energy to sit up. She did not have to complete hours of missed schoolwork, as homework, within the "gracious" 2 extra days. It was such a freeing moment to not be panic stricken over the missed school and simply worry about my ill child, and my slightly unsettled stomach. Thursday, we returned to a school-like routine, except for an errand to complete Amber solo dance costume. It dawned on me Tuesday that I've been altering costumes for other dancers but never checked Amber's. Sure enough, three of the 5 have to be altered. Guess I know what I'm doing this weekend. 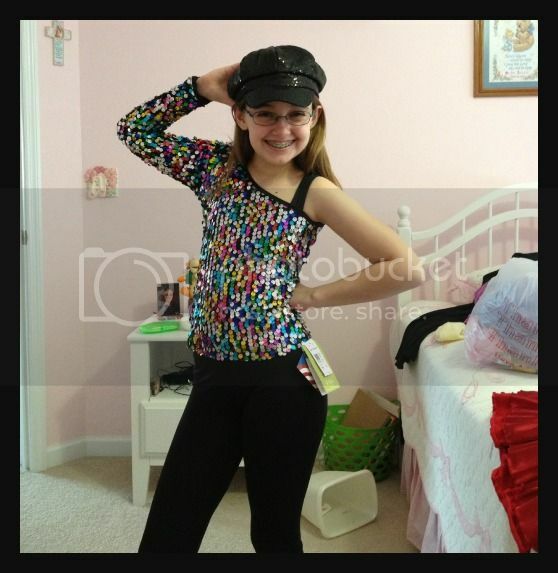 Amber's solo dance costume. We had just gotten the pants, thus the tags still. Now if I can just figure out what to do with the hair. Sigh. She removes the hat halfway through the dance, and will still have other recital dances after. Need to avoid hat hair, somehow. Amber finished her history unit on WWI with a test on Thursday. It was a short and quite broad study that did not entirely please me. Thankfully, Amber seems to have grasped the main issues and is now interested in how things progressed afterwards. She did watch a couple of movies about Anastasia from Amazon via the PS3 while she was sick. The movies gave her a better feel for the class differences at the time and were a good starting point for discussions about the Russian revolution. Over the weekend I signed up for the free Amazon Prime membership to aid in my sporadic Christmas ordering this year. (LOVE IT, I may have to keep it!!!) We had never bothered to set up Amazon Instant Video through the PS3, even though we have Netflix, or maybe because we have Netflix. Lately, I've been annoyed with the entertainment movies available through the streaming Netflix and I'd really like the ability to rent newer movies immediately, instead of waiting for disc delivery. Since we now had Amazon Prime, I decided to give Amazon Instant Video on the PS3 a try. I'm actually pleased with the variety and the ability to rent movies. There is a slightly different selection of free items on Amazon compared Netflix. Some tv shows we watch free on Netflix are 99 cents per episode on Amazon. Yet, Amazon seems to have more free movies that interest me through Prime. I'm torn, and somewhat afraid we will end up with both Amazon Prime and Netflix. A tradition, Amber must be a reindeer while we decorate for Christmas. But this year my reindeer is looking like such a big girl. A couple of pretty Amber pictures. We were trying for the Christmas card picture, but the light wasn't right. Maybe another day. 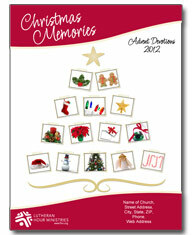 This week I finally downloaded for my own use a daily Advent study, called Christmas Memories, from The Lutheran Ministries. It is geared for adults, but from perusing it, it will definitely work well for Amber too. Our church is cutting it close and will not be making the Advent devotions available to the congregation until Sunday, the first day of Advent. I'm afraid the children's study selected may be too young for Amber, but I won't have a chance to see it until Sunday. So, for now, we are going with the Advent study from Lutheran Hour as our religion lessons in December. The study is free and available for download as a PDF, formatted for ereaders, or for print. It is also available to read online, listen to as a podcast, or be emailed as a daily subscription. I downloaded both PDF versions, but we probably won't bother printing since we have an iPad and Nooks. It is a simple study, with a Bible selection to read, some thoughts on the theme and application to our life, and a prayer for the day. I've used their studies for myself for many years and have always been pleased. It is my favorite resource this week, besides my new obsession with Amazon. So, while this wasn't the extremely academic week that I had planned, the required items were completed and we have a new appreciation for homeschool. Thankfully, Amber seems well now and we can hopefully enjoy the rest of the Christmas season without any illnesses. Have a great weekend and enjoy the start of Advent! I am so sorry to hear she was feeling so poorly. I love your idea of focusing all your studies around some holiday themes. Wonderful idea. Sounds like you got a lot accomplished considering the illness. Every time my girls get sick I thank God I don't have to make the decision about sending or not like you mentioned. What a blessing! Oh, how fun - both The Christmas Carol and Nutcracker! We're supposed to go to an adaptation of The Christmas Carol next week with the kiddos. They haven't gone to many plays so it should be an experience. How cute! 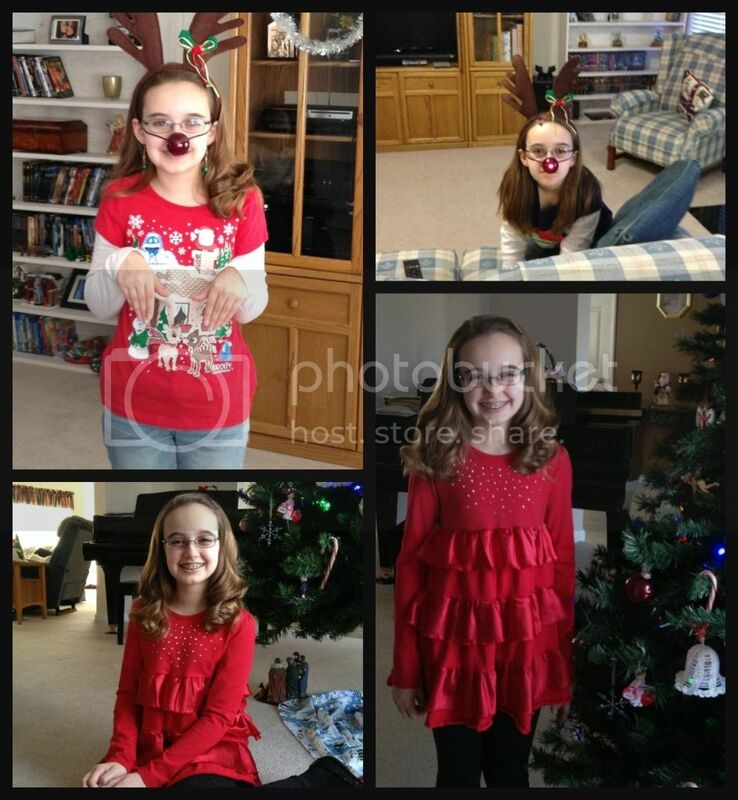 Love the photos of her with the nose and reindeer ears! And a very pretty dance costume! I hope everyone is feeling well! So sorry about the stomach bug. It's going through our dance troupe as well, and we have stage week starting Monday! We're working on a Nutcracker unit as well, to go along with next weekends performance. I'll be sure to check back and steal ideas from you! Awww - being ill stinks. I had a sickie kid this past week too. I love the adorable reindeer photos! What a week! So sorry Amber was feeling sick...that's the worst kind of sick, in my opinion. Hope everyone is healthy now! So sorry that Amber was sick. I hope by now she is feeling much better. Looks to me you did a ton of great things! Amber looks so cute in her dance outfit. About her hair can you do a low twist bun? I do that with Kei's hair at times when she wears a hat. It is really easy to retwist if needed. I love her reindeer nose!! So cute. Keilee is almost finished with what she is making Amber. Tell Amber she is so sorry it has taken so long but she has been so busy with play practice and all we have going on. She has had her letter ready for a couple of weeks but she wants to send it together. Hope you are having a great week Christy! Hi Christy! Love seeing what your sweet girl is doing but so sad she was sick! That is NO fun! Do you have an email address? I had a resource I wanted to share with you.